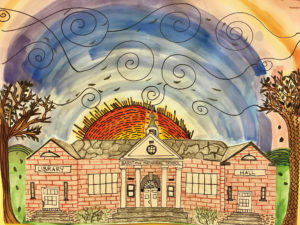 From the quiet of winter emerges much energy and excitement as the local students present their art in this annual show. It is a very special time for students, their families and the community to see their work displayed in a professional gallery setting. The Barstow School students experienced creating art outdoors with art teacher Jennifer Hogan, from observation, known as “Plein Air”. Pictured here is an exciting piece by Eva Menconi, grade 8, emphasizing movement in the fall season. The Brandon Artists Guild is a big supporter of art education, and contributes generously through community art projects and auctions. Most recently “An Artful Journey”, a series of art workshops for children and adults, taught by the Brandon Artists Guild members and local teachers, provided revenue for the schools. We invite you to come and support art education in our area schools by attending this popular event. 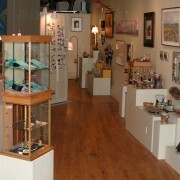 An opening reception with non-alcoholic refreshments will be held at the BAG gallery Friday, February 3rd, 5-7 PM. The show will hang through February 28th. All are invited to see what local students can do.